Back in the Windows XP time, the application manifest was the only way to give your application Windows XP visual style. Today, the UAC (User Access Control) Windows Vista feature puts on developers the task of marking their applications with manifests which declare if the application would like to run elevated or not. You can specify the desired runlevel for your application by selecting one of three levels. 1. 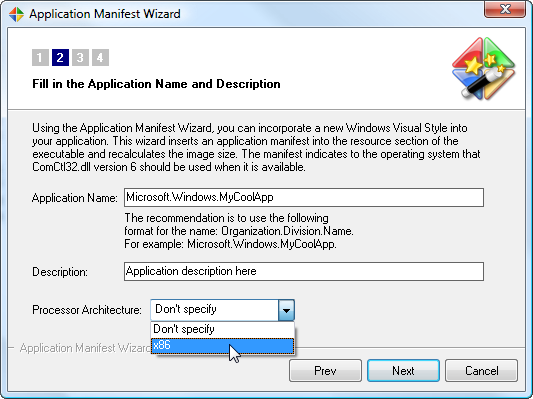 Open your file with Resource Tuner and click the Application Manifest Wizard button to bring up the wizard. 2. Read the Welcome message and click Next. 3. The wizard will verify a link to ComCtrl and necessary initialization calls exist. Having a link to ComCtrl is optimal - necessary in most cases but not all. 5. Check to add a Trust Info section to your manifest if you want to mark your file with a requested execution level on Windows Vista and 7. 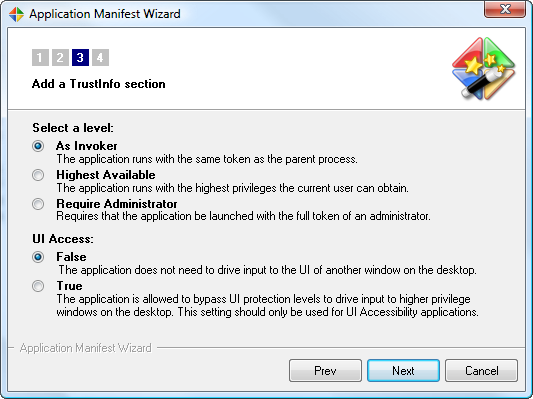 The wizard will generate an application manifest with the trust level section. 7. Click Finish to apply your newly entered data. 9. Click the Save File As button on the toolbar to save the altered file to disk. You can also use Save File As from the File menu or the [CTRL+S] combination to save your changes.